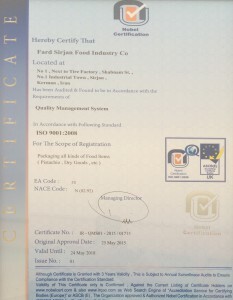 Sanae Ghazaei Fard Sirjan co. is registered as a private sector on 2005 in Sirjan ,factory and administration facilities are all located in 5,200 cubic meters area at Sirjan industrial reign . Sirjan city is at 180 km west of Kerman, benefitting from very special regional and climate factors that a unique pistachio grows with quite exceptional taste, property ,shape and colour , with no similarity in all over the world. 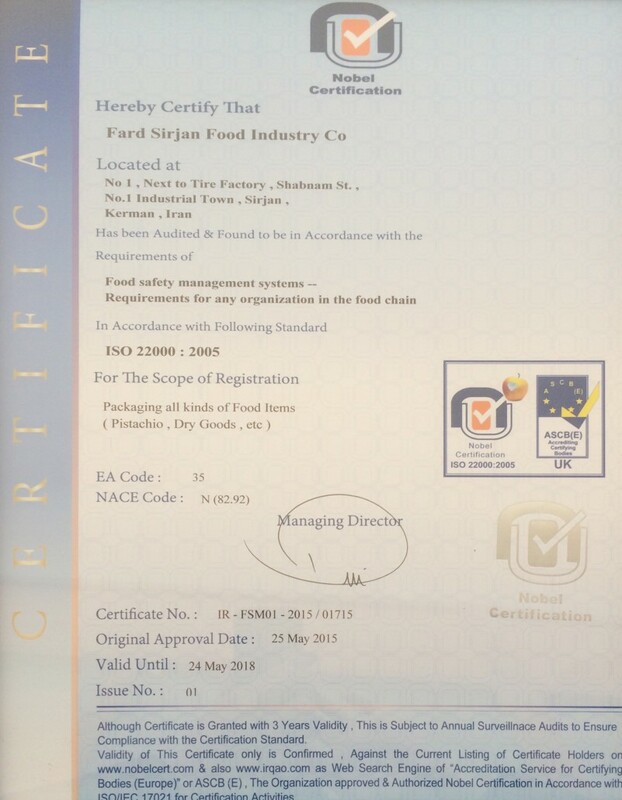 Our firm was officially approved by authorities and permits was obtained on 2009, since then we are busy in dry food processing and export of our products. Our location ,being closed to pistachio farms provides opportunity for us to take care of crops immediately after being presented to market, if they are not shipped directly to us . Our different workshops , equipped with modern machinery with high standards of safety procedures of food processing are ready to proceed. Our operation consists quality control of any arriving pistachio, sifting with our automatic machinery ,sorting ,heating indirectly with appropriate means ,flavor process ,adding salt and natural lemon juice according to health organization’s observation ,drying with our automatic warm air blower machinery. 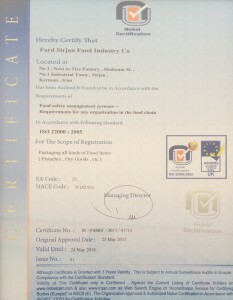 which is also automatic and proceeds according to order of our customers of 32 countries . 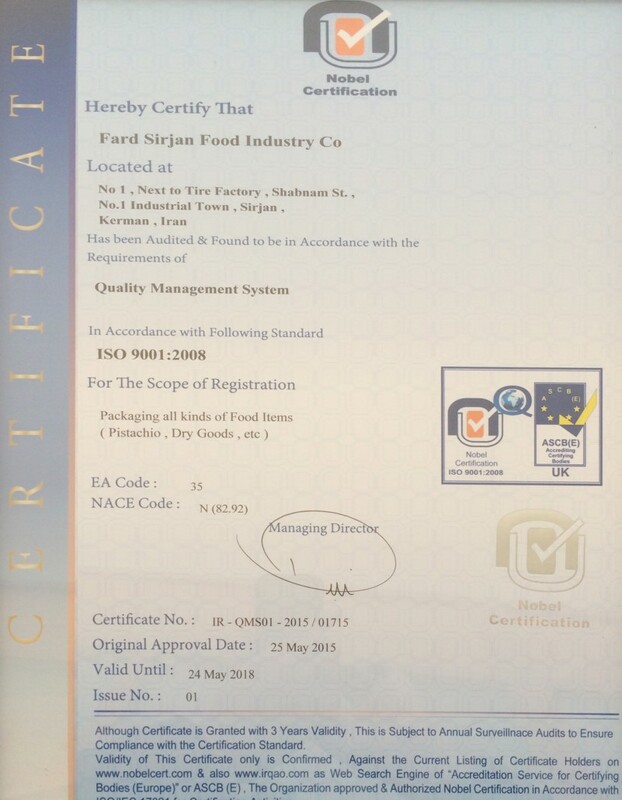 Industrial office of Kerman province has issued our Exploitation license on 2009, we also posses approval of ISO 9001 and 22000 ,at present by management of Mr. Gholam Reza Rasoli we are dealing with production, pistachio processing, packing , distributing and export of best Iranian dry foods.